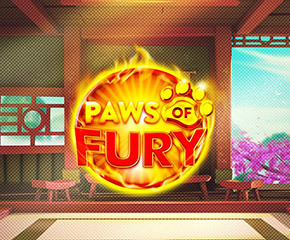 Paws of Fury slots is a Chinese themed game inspired by the Kung Fu Panda animated movie series. The panda is the main characters of this slot game as well. There are twenty paylines in the slot game that are spread across five reels by three rows. The reels are set in a Chinese monastery with an outside view of pink flowers on trees. You can see their petals flying inside to the cool breeze of the wind and the panda floating in the air in a meditation pose. There is an ancient meditation music that sounds pretty relaxing to the mind. The betting here starts with £0.20 and you can raise it up till £500 a turn. This wonderful kung fu fighting themed slot game was created by Blueprint Gaming. They are a developer with experience of over 20 years in the industry who have produced hundreds of entertaining games for online gamblers. The symbols of Paws of Fury slots feature the gold emblem of game logo followed by the monastery, bowl of dumplings, a book and the ninja cat. The symbol from which you can win maximum rewards is the game logo emblem that pays 500x on your betting stakes. You need to land five of its kind on the reels to win that. The play cards Jack, King, Ace and Queen are low valued ones from which you can win 50x to 100x on your betting. The panda’s golden paw print and furious looking face of the panda are two special symbols. Wild Feature: The golden paw print symbol is the wild of Paws of Fury slots. It backs all the symbols of the game, bar the bonus panda symbol. Wild can appear on all reels and with multiple appearance of them on the reels, you can expect to win massive rewards. Scatter Bonus: The symbol of the furious face panda is the scatter and three or more of it unlocks the bonus. You can then win one of five bonus features that give you bet multipliers, win multipliers, roaming wilds, special wilds, free spins and other exciting bonuses. Panda Modifiers: During the game, the panda randomly appears to award you an additional random bonus. They give you special spins, wilds and cash prizes. 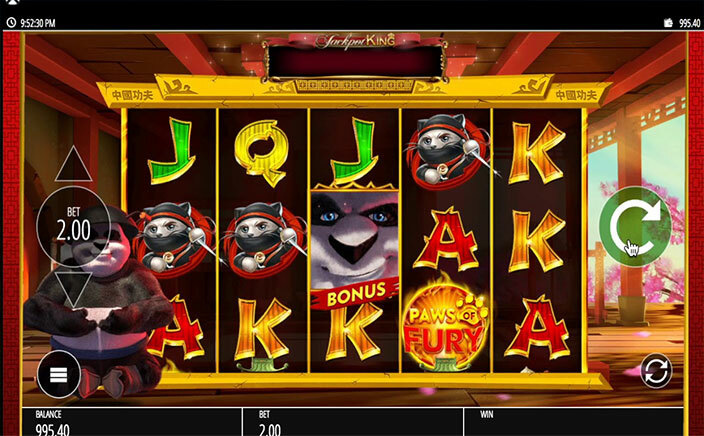 With action packed panda to give you some surprises, you are sure to win impressive rewards in Paws of Fury slots. The RTP here is 95.16%.